1. We’ll forgo eating at a restaurant that has a B rating posted in its window, yet we’ll happily buy lunch from the sketchy food cart on 19th Street and Park Ave.
2. Instead of being horrified by the sight of a rat dragging a slice of pizza down the subway stairs, we shoot a video of the little guy, call him Pizza Rat, and create an overnight internet sensation. Even The New Yorker publishes an article about him. 3. We live in a city with literally thousands of restaurants but when a Chick-Fil-A opens on 37th and 6th avenue, there is a line with an hour wait for a chicken sandwich…from Chick-Fil-A. 4. 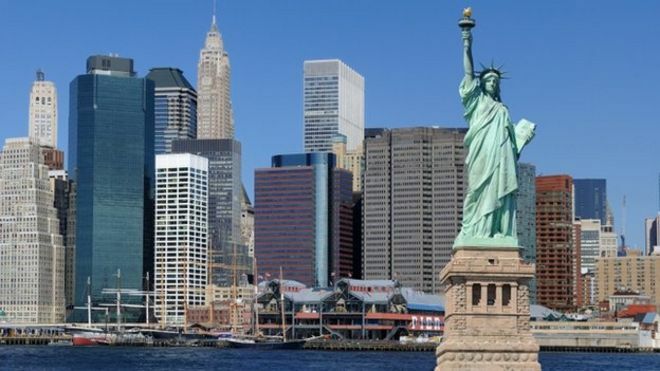 Nearly 3.5 million people come from all over the world to visit the Statue of Liberty each year, yet most New Yorkers have never been to Ellis Island nor do we have plans to go anytime soon. 5. Then, Milk-Shake Squirrel arrives on the scene and ends the reign of Pizza Rat and we are obsessed with which one is better. 6. Us New Yorkers will pay a couple hundred dollars a month for a membership to Equinox fitness clubs while complaining every day that we live in a 5th Floor walk-up and have to climb all those flights of stairs. 7. New York is one of the few cities with a true 24/7 mass transit schedule, yet complaining about the unreliability of our subway system is one of our favourite past times. 8. We talk about how expensive living in New York is all the time. We probably pay close to $2,000.00 a month in rent for a tiny studio, or we live with six other people to make ends meet, yet most of us have zero intention of going to live somewhere cheaper. 9. We think that any real estate for sale for less than $500,000.00 is ridiculously inexpensive. 10. We complain about all the tourists taking pictures and blocking the sidewalk outside 30 Rockefeller Center, but every year we secretly make our way over there to look at the Christmas tree. 12. We’ll cross the road when we want, where we want, then yell at the drivers who have to screech to a halt to narrowly avoid us. But we won’t walk over the cellar doors on the sidewalks. Those things are dangerous! 13. When we do have to stop at a ‘Don’t Walk’ sign on a corner, we stop a few feet into the street, in front of everyone else who has stopped. We pride ourselves on being the first one out of the gate to cross the street even if we aren’t in a hurry to get anywhere. 14. We’re always rushing to catch that train even though we know another one is coming in a few minutes. 15. New Yorkers get annoyed when a train doesn’t show up after a few minutes of waiting on the platform. But, when we do, unfortunately, find ourselves on a stranded E train, instead of freaking out and getting angry, we have a hip hop party and everyone sings along. Because that’s how we roll.